Frederick in Flight started in 2011 as a fun way to get folks together and see a sight they normally don't get to see - hot air balloons in their own community! 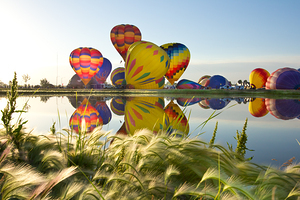 Since then, Frederick in Flight has grown to be one of the most popular hot air balloon rallies in the state of Colorado! 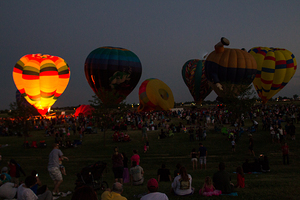 With over 30 balloons, a popular glow party at night, and the small town charms Frederick has to offer, you won't want to miss this spectacular event! Take I-25 to Exit 235. Go east on State Highway 52. Turn left (north) onto Colorado Boulevard. Take your first right (east) onto 5th Street and your first right again onto Main Street. Turn left (east) onto 8th Street and take it to Walnut Street. Centennial Park is on your right.